This guide gathers resources and information about innovative nutrition education programming by organizations around the country. These models can serve as examples and inspiration to create new programming or as sources for collaboration and ideas. While geared towards emergency food providers — broadly defined as any organization that works on access to nutritious food for low-income people — the guide is equally useful for any organizations conducting nutrition education. WhyHunger gathered and synthesized resources and case studies about innovative nutrition education programming from organizations around the country. The programs and activities highlighted within the guide provide examples and inspiration for emergency food providers to expand or strengthen their programming, forge new partnerships and collaborate with others in order to fulfill their commitment to improve the health and well being of their community. Organized by chapters that delve into specific components of nutrition education programming, such as cultural competence, evaluation, curriculum and more, users can focus on the sections that pertain to their goals or read the guide in its entirety. Organizations featured include Share Our Strength, the Sustainable Food Center’s La Cocina Alegre/The Happy Kitchen and Second Harvest Food Bank of Santa Cruz County. 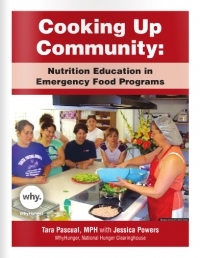 Cooking Up Community: Nutrition Education in Emergency Food Programs is a living document. Therefore, your thoughts and input are greatly valued! Download the full PDF publication.